The Northern Avenue bridge built in 1908 is recommended to get another lease on life. The bridge is one of the last remaining swing bridges in New England and is an engineering marvel to watch when it’s in motion. The bridge was not only designed for pedestrians and cars, but also the Union Freight Railroad. 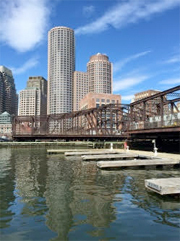 The overall volume of commutes into the Seaport will increase 63 percent by 2035…The study committee’s consensus: restoring the three-lane bridge, with one lane dedicated for motor vehicles. Pedestrian and bicycle access also would be preserved.